The International Solar Alliance (ISA), an international partnership for promotion of solar power in the world, is essentially an Indo-French initiative and its first summit was held in New Delhi in March 2018 on the occasion of the state visit by the French President, reinforcing the two countries’ commitment to the alliance. March 11 saw the first summit of the International Solar Alliance (ISA), held in the Indian national capital New Delhi, on the occasion of French President Emmanuel Macron’s state visit to India. Macron co-chaired the inaugural session with Indian Prime Minister Narendra Modi. The ISA is the result of a joint initiative of India and France that aims to bring together 121 countries with high solar potential, located between the tropics, in order to develop the use of solar energy as a platform for cooperation between developing countries enjoying a high level of sunshine and countries with solar technologies. The high-profile meeting, suitably hosted at the Rashtrapati Bhavan (President’s House), was attended by dozens of heads of states and high-level officials, including the United Nations (UN) Secretary General Antonio Guterres, heads of development banks, various energy companies and members of the civil society. The participants were welcomed by the Solar Mamas, a group of rural women from various countries in the African continent, who brought electricity to their villages. These women, who did not have access to education, have not only become solar engineers but also trainers who pass on their knowledge to others in these areas that lack electricity. In fact, they were trained to build, install and repair solar equipment by the Barefoot College, founded in the early 1970s, in Tilonia, Rajasthan, by Sanjit Bunker Roy. Supported by India, the programme has gained momentum. Thus, several training centres exist in Africa today and the organisation works in nearly 100 countries around the world. Living symbols of the importance of solar energy in development as well as India’s place in these initiatives, the Solar Mamas enchanted the audience at the summit with their songs, including ‘We Shall Overcome’. Their performance was qualified as a “strong point of the conference” by the Indian Prime Minister, who also expressed his support for the Barefoot programme. Two Solar Mamas also spoke during the event and the French President said that the example of Solar Mamas is one worth following. ‘‘Each Solar Mama should train 10 women in the development of solar energy and they in turn will each train 10 women who in turn… This is how we change the world: we launch a movement of transmission!” Macron declared during his speech at the event. The fight against climate change and the ecological and energy transition have become a strong aspect of the Franco-Indian partnership. As a result of a joint initiative of the two countries, the ISA was launched at COP 21 in Paris on November 30, 2015, to contribute to the implementation of the Paris Agreement on climate change. Its entry into force came after the 15 ratifications, on December 6, 2017. Thus, the ISA became the first global organisation to be headquartered in India, with the ISA secretariat in Gurugram, near New Delhi, within the campus of the National Institute of Solar Energy. Of the 121 countries invited to join the organisation, some 60 states have signed the framework agreement and 32 of them have already ratified it. At the One Planet Summit held in Paris in December, France and India reiterated the importance of the project and their involvement in the ISA, which in itself is one of the 12 commitments made at this summit. On this occasion, they welcomed the ISA countries for an “International Solar Alliance on the Move” meeting where companies, international organisations and technical operators joined together to carry out an inventory of solar energy projects, corresponding to the needs expressed by countries or communities. Several meetings of the international steering committee, led by India and France, as well as other meetings were also organised, both in New Delhi and Paris. The goal of the ISA is to develop the use of solar energy in 121 highsunshine countries located between the Tropics of Cancer and Capricorn, which are mostly developing countries and represent 73 pc of the world’s population. It is therefore, a matter of supporting those countries which, despite their wealth of solar resources, nevertheless have difficulties in accessing solar energy. They represent only 23 pc of the world’s installed photovoltaic capacity, particularly because of technological and financial hurdles. Also, between 20 pc and 50 pc of the population in these countries lacks access to electricity. 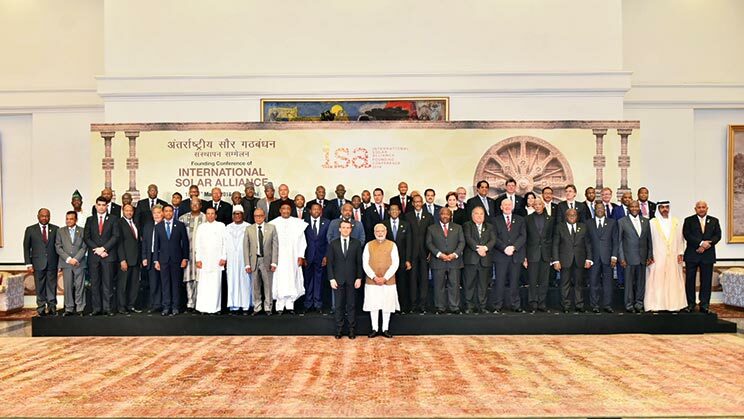 The ISA has set itself a goal of pooling resources to mobilise USD 1 trillion in investments to develop more than 1,000 GW of solar energy by 2030. For this, the ISA has constituted a platform for cooperation on solar energy between the countries and all actors in the sector. The programmes focus on four fields of action, as per the requirements of most of the ISA member countries. These programmes include using solar for agriculture as a majority of the countries have agrarian economy; creating mini-grids for villages and small islands by using roof-top installations; to generate small quantities of energy in a decentralised way; and finally mobility using solar power as fossil fuel powered vehicles constitute a strong source of pollution and global warming. In this context, the ISA works to allow its member nations to access to low-cost financing by pooling resources. It also seeks to establish the common principles for legislation and regulations and to create a common guarantee mechanism. The ISA summit of March 11 has allowed further discussions on solar energy issues as well as to involve more countries and international organisations, several of whom signed agreements with the ISA on this occasion, such as the United Nations Development Programme (UNDP) or the International Energy Agency (IEA). The summit was also an important event for civil society, NGOs and businesses, which decided to create an International Committee of Chambers of Industry to develop initiatives to promote research and training and to take concrete action in this area, in particular by the 100- odd projects in the member nations that the ISA will support. The summit also saw the adoption of a project implementation roadmap, called the ‘New Delhi Solar Agenda’, and resulted in important announcements, such as Macron’s commitment of providing EUR 700 million by 2022, in loans and grants, through the French Development Agency, which is in addition to its initial commitment, bringing its total to EUR 1 billion. 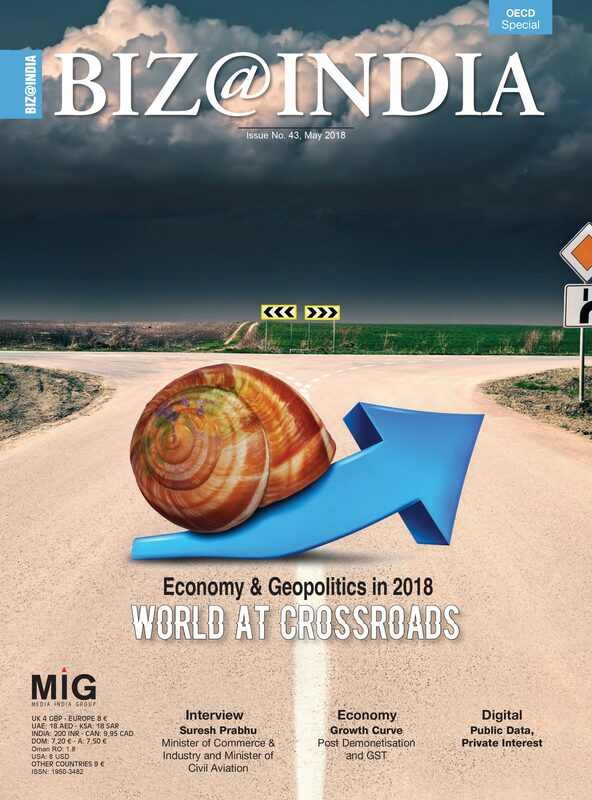 Citing the beginning of a “solar technology mission of an international dimension” for India “to fill the technological gaps,” Modi, meanwhile, announced lines of credit of just over EUR 1.1 billion to finance 27 projects in 15 countries, while India has so far funded 13 projects worth EUR 117 million.